L-Għaqda Mużikali Imperial, bil-kollaborazzjoni tal-Kunsill Lokali tal-Mellieħa, tellgħet programm vokali u strumentali fl-okkażjoni tal-Ġimgħa Mqaddsa ġewwa l-Knisja Arċipretali Marija Bambina, il-Mellieħa. 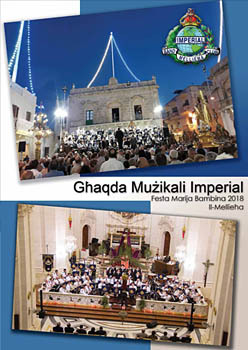 The Imperial Band Club, in collaboration with the Mellieħa Local Council, organised a vocal and instrumental concert in the Mellieħa Parish Church to mark the beginning of the Holy Week. Copyright © 2013 - Website by Foto Creative Ltd. All Right Reserved.